Existing Fidelity customers are the natural fit for Fidelity Go, the robo-advisor arm of the Boston-based company. Clients will pay a management fee immediately with any amount. However, if you already have a retirement account and would rather not pay an active manager for it, you can use this robo-advisor as a less expensive, hands-off option for your IRA. Existing Fidelity customers or general hands-off investors. No fee breaks for low or high accounts; You can't transfer securities into an account. Pricing: How Much Does Fidelity Go Cost? On par with many other robo-advisors, Fidelity Go doesn’t charge trading commissions, transaction fees or rebalancing fees. Where the company differs from some firms is that you won’t be charged higher fees for larger balances. The gross advisory fee is 0.35%, regardless of what your balance is. Some companies will charge a higher fee as your account balance reaches certain thresholds such as $100,000, but with Fidelity Go the fee will the same. Fidelity Go also has one plan no matter what your investment amount is. Some companies, on the other hand, add certain features as you move up tiers. You get the same service at $5,000 as you would at $250,000. In addition to the 0.35% fee, you’ll pay minimal fund expenses and SEC fees, which Fidelity Go estimates will bring you to a total of 0.40%. The extra 0.05% is for mandatory SEC charges and certain fund expenses. The company states that it focuses on low-cost funds for investments. That means when your money is being invested in mutual funds and exchange-traded funds (ETFs), it will be those with low fees. This is a consumer benefit as certain mutual funds have high fees that eat into any interest you may earn on the investment. Wondering how you’ll be charged for fees? Each quarter your advisory fee is calculated and automatically deducted from your account. As for fund expenses, those are calculated into the fund’s performance. You’ll never receive a bill for fees, as it will be automatically paid through your account. You can withdraw money from your Fidelity Go account without having to pay fees. However, if you decide to close your account and withdraw the entire balance, you will be charged the net advisory fee for the time your account was managed. There aren’t fees for the account termination itself. Your account’s day-to-day investment and trading lies in the hands of Geode Capital Management LLC, an investment advisor that Fidelity has worked with since 2003. Your account will be invested in a variety of securities including ETFs, mutual funds and municipal bonds. It depends on your risk strategy and age for what the exact mix of investments. The initial strategy is determined when you answer the questions in the initial onboarding questionnaire process. You can’t buy and sell individual investments, but you can place certain restrictions on the management of it. To do so, you have to call and speak with an investment professional. At any time, you can change your investment strategy to any of the suitable options available to you. You’ll have to change the information in your account profile for this to occur. If your portfolio drifts from the strategy you selected, Fidelity Go will rebalance it as part of included services. Rebalances include buying or selling certain types of assets to bring your account back to the selected strategy. Only four kinds of accounts are offered: Roth and traditional IRAs, taxable accounts and rollover IRAs. One of Fidelity Go’s benefits is automatic rebalancing with every account, regardless of how much money is in it. If your investments drift off of the course you specified during onboarding or subsequent strategy chances, Fidelity Go will correct it. You don’t have to login and ask for it, it’s an automatic feature. When your account seems off course, certain securities will be bought or sold to realign you to it. There’s no fee for this feature. Another feature is free access to planning tools and resources offered to Fidelity customers. This can help you better plan for retirement and other financial decisions. There’s also a mobile app for on-the-go monitoring and banking, and you can use live chat or a phone call to get in touch with the company. Like almost all robo-advisors, you can set up automatic deposits into the account from a linked Fidelity account or an external linked bank account. If you’re already a Fidelity customer in another capacity, you may want to try Fidelity Go. The site offers account linking to existing accounts for Fidelity customers. Using the digital “robo-advisor,” function for some of your investment accounts can help you save fees that active management charges. And if you opened an investment or retirement account assuming you’d actively manage it, but instead neglected it or gave up actively monitoring it, Fidelity Go might be for you. However, keep in mind this company doesn’t offer tax-loss harvesting on taxable accounts. But if that’s not a concern of yours, or you’re planning on opening an IRA which is considered tax-advantaged, you may be more interested. While this could be a solid choice with its basic but reasonable offerings and fees, many potential investors could be better served elsewhere where more options are available. Fidelity Go is an OK choice for retirement management, but fees are slightly higher than competitors, with no obvious benefit for using them over a competitor. It’s a simple process to sign up for a Fidelity Go managed account. First, you have to be at least 18 years old and a U.S. resident to open an account. Once you navigate to the website, you’ll click through a number of questions about your age, financial situation and financial goals. The company will come up with a recommendation for what account or accounts you should open on the site and the mix of investments your portfolio should have. It’s up to you though, so if you don’t agree with the suggestions, you can still open the account of your preference and change around the portfolio ratios. What you can’t do is pick individual mutual funds or stocks yourself. That’s what you sacrifice when opting for a robo-advisor. The service will manage your funds for you, but you can’t actively participate more than changing your preferred investment strategy. If you want to know how much you’ll pay for the service, you can use the slider estimator to see what your estimated monthly costs will be with the balance you maintain in the account. There's a flat 0.35% gross advisory fee. Fund expenses and Security and Exchange Commission (SEC) fees will be added to your costs as well. You won’t be charged trading commissions, transaction fees or account rebalancing fees either. There also is what’s called a variable fee credit that may reduce the 0.35% gross advisory fee. The credit is to help address any potential conflict of interest with your account having investments in Fidelity funds. Once your account is set up, you’ll need to fund it. You can move cash from an existing Fidelity account by transferring funds. You have the option to make a one-time transfer or automatic monthly transfers. For outside customers, you can link your external bank account so that you can use electronic funds transfers. The last method it through a check. You have the option to scan it in using the company’s mobile application or you can mail it in. After your money has been received and invested, you can try out the target tracking feature. You input the dollar amount you’d like to reach by a certain date and you’ll get an estimated likelihood of success and suggestions of how to get there. You can monitor your portfolio online and update your information and preferred strategy at any time. Each month you’ll receive an email with a monthly progress report, so you don’t even have to log on if you don’t want to. And if you want to speak to someone, the company offers live chat and phone support. There’s always a trade-off when you opt for someone else (or something else in this case) to manage your money. First of all, you have to pay a fee for the service. If you wanted to invest on your own, you could save on fees, but it would take up a percentage of your time. Next, if you’re deadset on using a robo-advisor, Fidelity Go doesn’t offer as many account options as its competitors. With only four options listed: traditional or Roth IRAs, taxable account or rollover IRA, you miss out on the wider range of options that other services provide. This can include accounts such as 529 college savings plans, trusts or SEP-IRAs. The company also doesn’t offer tax-loss harvesting which is a feature other robo-advisors offer for taxable investment accounts. If you’re using an online investment company for a retirement account, that won’t matter to you as much since IRAs are considered tax-advantaged investments. Competition: How Fidelity Go Stacks Up? Fidelity Go looks a little left behind in the dust compared to some of its competition. For example, Wealthfront requires $500 to open an account, which is a great option for those smaller funds available to invest. It charges a flat 0.25% fee across all accounts. With Fidelity Go, on the other hand, there’s also a fee of 0.35% right off the bat, though there is no investment minimum. Fidelity Go also lacks some of the account options found in other robo-advisor companies, such as 529 college savings plan accounts and trusts. If you want to use one company to passively manage all of your accounts from your retirement to your investments for your children, you’d be better served with a different company that offers those type of accounts. You also can’t sync a 401(k) you have through your employer. 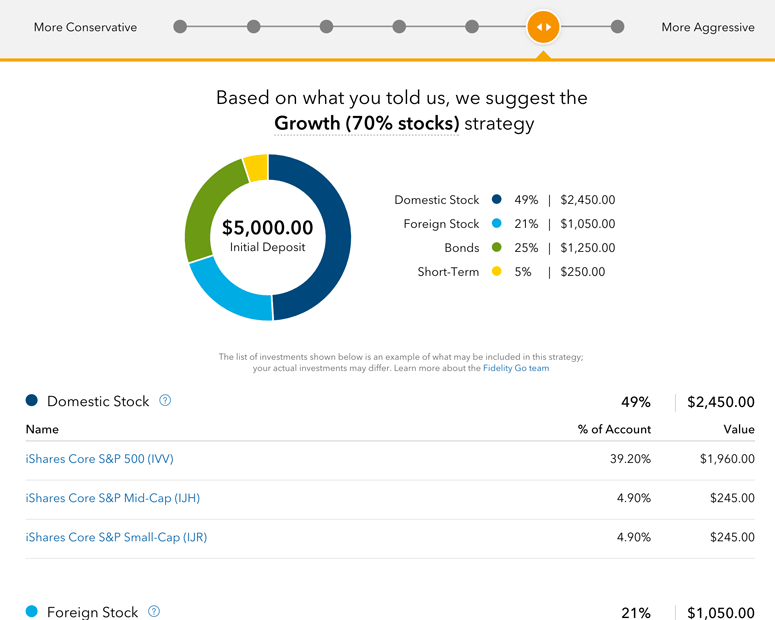 Blooom is an online service that will optimize your 401(k) options. Betterment also has the capability to sync your outside 401(k) account so you can monitor it through your investment dashboard. Fidelity Go does offer 401(k) rollovers to an IRA, but that’s the extent of the integration you can do with it. Tax-loss harvesting is another feature that Fidelity Go lacks. This could be important to you if you’re planning to open a taxable investment account. If this is the case for you, you could consider Betterment or Wealthfront to see how tax-loss harvesting could potentially benefit you. If you’re looking for free online management, you do have a few options. WiseBanyan offers free portfolio management starting at the $0 account minimum. You’ll still be charged for regular investment costs that accompany certain securities, which is non-negotiable, but you won’t be charged for the management of your account. Schwab Intelligent Portfolios requires a minimum investment of $5,000, but it doesn’t charge for portfolio management. When you’re comparing each advisor, you’ll have to focus on what features matter the most to you. If it’s a large variety of account options, you might want Wealthfront or Betterment. If it’s low management fees, you may consider the companies that offer the service for free. Whatever you choose, it’ll be up to you and your current financial goals. Bottom Line: Should You Use Fidelity Go? If you like the idea of a robo-advisor firm that is part of a larger company that has years rooted in the investment world, you may find Fidelity Go a good fit. While other companies may have been in robo-advising longer, Fidelity has been in the investing realm for a long time. That said, account options are limited and advisory fees are a bit higher than at some other newer companies. Additionally, free advising for low balance accounts is not an option at this company. One advantage is that fees don’t scale up with higher investments, which differs from some online investment management companies that increase fee percentages as your account balance grows. But the negatives still outweigh the positives with no tax-loss harvesting for taxable accounts. If you want the biggest bang for your buck, you may want to consider the other options out there before committing your money. Consider your risk tolerance before investing your assets. This can help figure out the best asset allocation for your portfolio. Start sooner than later. Once you've paid off any debt and established an emergency fund, start investing so your money can grow over time. If you don’t have the time or know-how, hire a professional to help you. 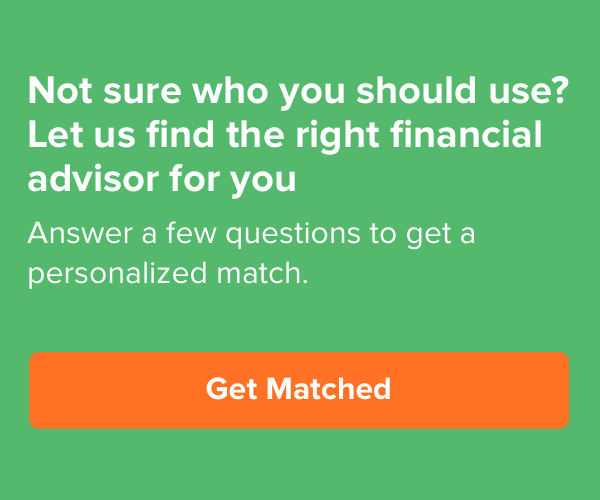 The SmartAdvisor matching tool makes it easy to find someone to work with. Simply answer a series of questions about what you’re looking for in an advisor and the program will pair you with up to three advisors who suit your needs.